Twenty years ago in 1999, TASCHEN published its first monumental art book: Helmut Newton’s SUMO. It came out on the market in the exceptionally large format of 70 x 50 cm, in a print run of 10,000 copies, all personally signed by the photographer, and was delivered with a metal stand designed by Philippe Starck. Later, a copy of SUMO that had been signed by numerous celebrities at a charity auction would become the most expensive book of the 20th century. Ten years ago in 2009, the Helmut Newton Foundation staged an unusual yet compelling exhibition dedicated to this legendary publication: all 460 pages of the book hung framed on the wall, side by side, in three rows one above the other. Exhibition visitors were literally able to see everything at once. This made it possible for them to draw immediate comparisons between more 400 iconic images by Helmut Newton, from the genres of fashion, portraiture, and nudes in black-and-white and colour. Now, a decade later and 20 years after its creation, SUMO will once again be presented at the Helmut Newton Foundation. 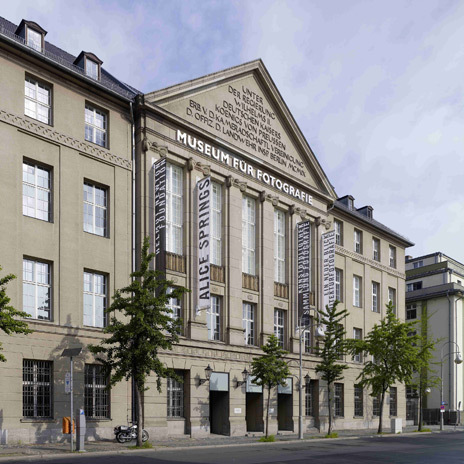 At this exhibition in Berlin as in the book, we encounter Newton’s famous Big Nudes, fashion shots for various editions of Vogue, Elle, Stern, and Vanity Fair, as well as portraits of famous actresses and artists, such as Liz Taylor, Jodie Foster, Salvador Dalí, and Andy Warhol. Newton’s SUMO exhibition is complemented by an expanded reprise of the “Three Boys from Pasadena”. Ten years ago, the works of three of Newton’s former assistants – Mark Arbeit, George Holz, and Just Loomis – were featured all together in one of the foundation’s exhibition rooms. For this new exhibition, each of these American photographers will have a dedicated space for his unique and multifaceted oeuvre. Mark Arbeit will show a new series of life-sized photograms of female models along with a series of small-format photograms of toy dolls – a visual homage to Helmut Newton and his passion for collecting. Joining the black-and-white nudes by George Holz from the previous exhibition will be a host of his Hollywood portraits – including of Madonna, Andie MacDowell, Jack Nicholson, and Steven Spielberg – many of which have appeared in well-known magazines. And Just Loomis has selected some of his “Backstage” works to complement his “Americana” series from the exhibition in 2009. With “Backstage”, Loomis gives us an intimate flipside-view of the glamorous fashion business – the concentration, frenzy, and intense emotional energy of the models behind the catwalk. For the first time on public display is the exquisite private photo collection of Helmut and June Newton, which has recently come into the care of the Helmut Newton Foundation. In “June’s Room” – parallel to SUMO and Three Boys from Pasadena – there are now over 50 valuable vintage prints in their original frames. These include portraits by August Sander, Brassaï, Ralph Gibson, Mary Ellen Mark, Irving Penn, and George Hurrell; nudes by Man Ray, Robert Mapplethorpe, Henri Cartier-Bresson, Frantisek Drtikol, Diane Arbus, and Chris von Wangenheim; fashion photos by Horst P. Horst, George Hoyningen-Huene, and Richard Avedon; and landscapes by Franco Fontana and Peter Beard. In short, this is a selection of the most important photographers of the 20th century.